Taking a clue (or two, or ten…) from the Paleolithic doesn’t stop with food and exercise. We can use the “what did we evolve for?” Thought experiment to test all kinds of things – and one of them is what to wear on our feet. Now let’s apply the Paleo question to this: is this a big departure from evolutionary history, and if yes, does it have any negative consequences? The answer to the first question is pretty clearly yes. Compared to going barefoot, wearing shoes changes the way we walk and the patterns of force on the ankle, knee, and hip joints. We definitely didn’t evolve to walk that way, so walking and running in shoes presents an evolutionarily new challenge to our legs. But the second question is more important: does that new stimulus actually cause problems? As it turns out, it does – wearing shoes might be one reason why so many people today have flat arches, knee pain, back pain, hip pain, degenerative joint diseases, and overuse injuries. Here’s a look. When it comes to shoes, the easy targets are high heels. Most people are basically aware that high-heeled shoes are bad for your back, legs, and feet: they can cause back muscle imbalances, ankle pain, weird postural issues, the whole 9 yards. But even the shoes that are supposedly “better” than high heels cause problems – sometimes the exact problems they’re supposed to solve! One problem with shoes is that they prevent all the little muscles in your feet from really developing, which can cause foot posture problems. For example, you’ve probably known at least one person who has to wear arch supports or special shoes for “flat arches.” But what if those flat arches were caused by shoes in the first place? This study found that 9% of children who wear shoes have flat feet, compared to 3% of children who habitually go barefoot. Wearing shoes means that all the little muscles of the child’s foot don’t get a chance to develop as well as they should, causing a much higher rate of flat feet. Another problem with shoes is that they encourage a way of walking and running that puts more stress on the ankle, knee, and hip joints. This can aggravate overuse injuries, especially for runners, and also have noticeable consequences for people with joint diseases like osteoarthritis. When most people run or walk in shoes, their heel is the first part of the foot to hit the ground. This is called heel striking. Heel striking sends the whole weight of your body crashing down onto your heel with a very high force. It places a much higher twisting force on the hip and knee joints than going, and a higher overall “body crashing against the ground” effect in general. Our bones and joints evolved to handle the impact of walking and running – but not that kind of impact. The higher collision force of your weight hitting the ground may increase susceptibility to knee injuries and other overuse injuries, especially in runners. Even in people just walking around, the increased joint stress of wearing shoes may contribute to osteoarthritis pain in the knees and hips. And even when we try to use special shoes to solve the problems that we created with shoes in the first place, it doesn’t actually work that well. Did you know that no evidence actually exists to support heel padding in running shoes or specially-designed shoes for “over-pronators” and “under-pronators”? There’s no reliable evidence that these “improvements” actually heal or prevent injuries. The obvious solution: dump the heel padding completely and run the way our legs were built for. Barefoot walkers and runners typically land on the ball of their foot, using a forefoot strike. (Although there’s some evidence from lifelong barefoot runners in Kenya that an even more “natural” pattern is a variation in stride). (Even though this is about running, a lot of it is applicable to walking as well; it’s just that walking is lower-stress in general, so the effects aren’t as dramatic). Running and walking with a forefoot strike is more energetically efficient: you get more movement per calorie spent, so you can go faster and/or longer without getting tired. It also reduces joint stress. For example, this study found that running barefoot reduced stress on the knee. A couple of studies (like this one) point to the reduction in stress causing a noticeable improvement in running injuries, but scientific interest in barefoot running is pretty new and there’s not a lot of research on long-term effects yet. This page has a lot more interesting information about the biomechanics of barefoot running, plus some interesting video comparisons of natural/barefoot stride vs. running-shoe stride. Are Minimalist Shoes or “Barefoot Shoes” the Same? “Barefoot running” is typically meant to include both running in literally bare feet and running with minimalist shoes that have flexible soles and no heel padding, and restrict foot movement as little as possible. The big advantage of “barefoot shoes” is that they protect your feet from dirt, sharp objects, and anything else that might be on the ground. But there may also be important differences between truly barefoot running and running in “barefoot shoes.” Some studies have found that different “barefoot shoes” have slightly different effects and none are exactly the same as barefoot running. The problem might simply be that it’s too individual to really capture in a study. It’s possible that the really relevant thing might not be what type of shoe you wear, but how it affects your foot strike. If a particular minimalist shoe lets you forefoot-strike comfortably, then it might have all the benefits of barefoot running. On the other hand, if it encourages you to keep heel-striking, it might not have any significant benefits at all. 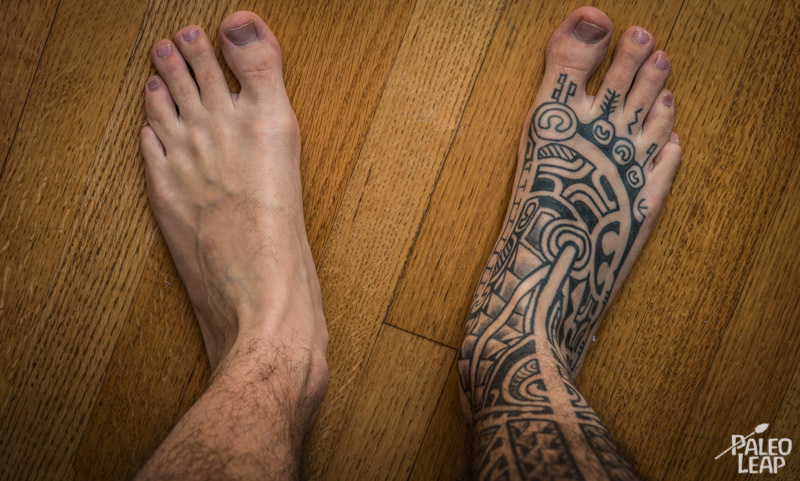 Everyone’s feet are a little different, so the “right” barefoot shoe is probably different for everyone, and it might not be something you can figure out from an average of 25 other random people in a study. It can’t hurt to shop around, check out a few, and see how your feet like them – even if “barefoot shoes” are a second-best to actually going barefoot, the reality is that they might be the only option for those of us who don’t have regular access to pristine, broken-glass-free, dog-poop-free trails. VIVOBarefoot makes zero-drop shoes, which encourage a forefoot strike. Once I got my pair of the Sprint model, I started wearing them full time right away. First of all, putting them on can be a hard thing at first. We are just not used to be placing our toes in separate pockets. After a couple of weeks though, it became a no brainer. It immediately felt very liberating to wear them. It really feels like you walk around with your bare feet. You feel everything on the ground and there is a very tribal sense to it. It felt weird in the beginning to walk “barefoot” in public places. It feels so natural that I even often forget to take them off when I get in the house. With regular shoes, I’m always in a hurry to get out of them when I can. You’ll definitely have to put them in the washing machine once in a while, because the odor that develops is quite distinctive. On a very hot day, my feet will sweat in them quite a bit and this is the only time that they become a little less comfortable than really being barefoot. They are easy to clean: throw them in the machine and then let them air dry. In the first few weeks wearing them, I noticed my feet were a little sore. I attribute it to my feet working in ways they are not used to and, like working out any other muscle, they were getting stronger. Indeed, the soreness went away and I can feel now that my feet are stronger. It has only been a couple of months now, but already my toes are a little more spread apart. My small toes used to be all jammed up against their neighbor in permanence, but they’re now slowly claiming their own territory. As a less enjoyable adaptation bout, I started to have sharp heel pain shortly after starting to wear them. I refused to put regular shoes in spite of the pain and it completely went away after a couple of days. I feel no pain whatsoever now. I’ve been wearing orthotics in my shoes since I was a child for a supposed ankle deviation. I knew that by wearing the Vibram Five Fingers I would stop wearing my orthotics and put myself at risk of pain by encouraging that deviation. I still wanted to try and see if being barefoot could potentially fix my deviation and flat feet problems. I really didn’t notice any positive or negative change after going barefoot at first with the Vibrams. For as long as I can remember, I’ve been complaining about tight hamstrings. The problem once became so bad that I also developed knee problems because of it. I sadly had to put on regular shoes with my orthotics recently and my tight hamstring problem came back to haunt me. I now have stopped wearing my orthotics completely and feel better. It will take more time to come to a definitive conclusion, but for now it seems as if my orthotics were doing more harm than good and that being barefoot has helped a bit with my tight hamstrings. Wearing regular shoes now feels like a real burden and I feel pain in my heels every time I do. They certainly get noticed and random people often ask me about them. It’s funny to see the look in the face of people as I walk down the streets and they notice my shoes. The extra attention might be intimidating for some, but I personally like to broadcast my difference and rebellion against the status quo and the conventional wisdom. People often ask me if it’s comfortable. “As comfortable as it gets” is my answer! I would recommend them to just about anybody and I think that the long term benefits will certainly pay off in terms of health and well-being. Supporters of barefoot running claim that it reduces injuries. Opponents claim that it increases injuries. They’re both wrong, but they’re also both right. Barefoot running and walking can reduce injuries and pain if you ease into it at a reasonable pace. But in practice, studies have actually found it often causes injuries and pain because people jump in too fast, push too hard, and don’t know what they’re doing. The forefoot strike pattern of running or walking barefoot might be “natural” for human beings, but if your body has been trained for years to move in a totally different way, you’ve effectively trained yourself to do the “unnatural” and getting back to “natural” movement patterns isn’t going to be automatic. Going barefoot demands more from your calf muscles and the little muscles that hold up the arch of your foot – give your body time to ease into it. It’s not for Everyone, and That’s OK. Very few things work out perfectly for everyone. But if you have knee/ankle/hip pain issues, especially osteoarthritis, or if you’re a runner of any stripe, going barefoot is likely worth checking out.